Hundreds of Serbs and Americans from all over the United States and Canada gathered together on May 31, 1994 in Chicago to celebrate the 50th anniversary of the 'Halyard Mission' rescue operation and pay homage to the American veterans of World War II and the Serbs under the command of General Draza Mihailovich who saved their lives. The 'Halyard Mission' was the name given to the greatest rescue of American and Allied lives from behind enemy lines in the history of warfare. It was a day of celebration, rememberance, gratitude and tears. For those that attended, it was a moving and unforgettable event, and for the guests of honor, it was an opportunity to tell a story of epic proportions. 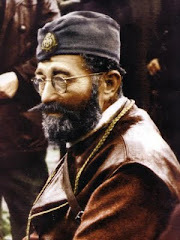 Fifty years before, in 1944, Serbian General Dragoljub Draza Mihailovich, his Chetnik forces, and the Serbian people loyal to them, saved the lives of hundreds of Allied airmen who had been stranded in Yugoslavia after having been attacked by the occupying German army. This great feat was officially noted in all of the releases and information disseminated by the World War II Commemoration Committee in recognition of the 50th Anniversary of D-Day. That committee, chaired by Colonel Kenneth A. Plummer and overseen by the United States Department of Defense, organized a weeklong celebration in Chicago, Illinois in conjunction with special events taking place throughout the world to commemorate that great moment in history. This five-day celebration in Chicago opened with the celebration of the anniversary of the successful 'Halyard Mission' rescue operation. This mission was a combined project of the American Strategic Services (O.S.S. - precursor of the C.I.A.) under the command of General William J. Donovan, Lieutenant George (Guv) S. Musulin, of the O.S.S. 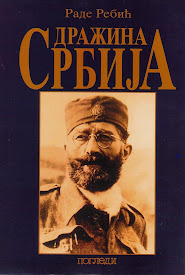 and an American of Serbian descent, and General Draza Mihailovich and his Serbian chetnik freedom fighters in the former Yugoslavia. More than a million Americans participated in this five-day celebration of the anniversary of D-Day, but out of all the ethnic groups in America, the only specifically named participants were the Serbs. 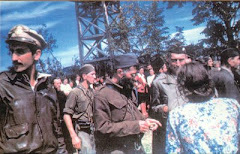 For different reasons, and always less than noble ones, the Halyard Mission rescue operation that took place over the course of the Summer, Autumn and Winter of 1944 in the Serbian areas of former Yugoslavia, was kept hidden from official public recognition and covered up, to the point of being left out of the historical texts relating to the World War II era. The Halyard Mission became a casualty of political supression but through the tireless efforts of those who knew the history and the significance of this great event, many of them who lived it and are now deceased, this epic heroic story is increasingly seeing the light of day. Although the following description of the rescue operation cannot do justice to the powerful drama, it will hopefully provide an adequate summary and will inspire you to learn more. As preparations for the Allied invasion of Europe via the beaches of Normandy (D-Day) during World War Two were in their final stages in early 1944, the United States Army Air Corps were assigned to bomb the Ploesti oil fields in Romania. The Ploesti oil fields were the Nazi Army's main supply of fuel at the time, and without them functioning, Hitler would not have been able to continue the war. To shorten the war, by just one day, meant this: If 50 million people lost their lives in just the four years between 1941 and 1945, that meant that an average of 12 million people died each year, which translates to an average of 33,000 people a day dying. Imagine it. Thus, shortening the war by even just one day, mean saving tens of thousands of lives. The destruction of the heart of the Nazi Army's war machine in 1944 was vital to the saving of those lives. Once it was established how important those Ploesti oil fields were to Hitler and the plan for their destruction was established, the Allies began their intensive bombardment of the Nazi strongholds from the air. From the early Spring of 1944 until the end of that year, waves after waves of Allied aircraft were flying from their bases in Italyl, crossing Serbian airspace in occupied Yugoslavia, to their destination over Romania. This was, indeed, one of the most dangerous missions of the war, and the effort would cost many Allied lives. The most intense bombings took place between April 5, 1944 through August 19th. Over 5000 Allied war planes participated and they included American, Canadian, British, Russian, French and Italian personnel. Many of the Allied planes that were attacked and damaged while flying over Ploesti managed tp sustain their aircraft in the air until they reached the territory of Serbia. Once they reached Serbian airspace, they were forced to abandon their damaged planes and parachute to the ground in Nazi occupied territory. Their families had no way of knowing if their sons and brothers were dead or alive. Once on the ground, many of them wounded, they would keep moving through the mountains and hills and forests and plains of Yugoslavia, not knowing what the next day or night would bring and if they would survive. On the run to avoid capture by the Germans, they didn't know if they would ever see their homes or loved ones ever again. It was in these Serbian lands that the downed airmen were found by the Serbian peasants, American allies of more than 120 years. This would be the blessing that the airmen desperately needed, for these Serbs would give them all the protection, support, and sustenance they would need to survive. None of these airmen would ever be captured by the Nazis. The Serbs were determined, even at high cost to themselves, to keep the American and other Allied airmen safe until they could be evacuated to safety. Eventually, all of them were placed under the protection of the forces under the command of General Draza Mihailovich. As early as October 18, 1943, Lt. George S. Musulin, an American officer of Serbian descent, had been transferred from Lybia, North Africa to Serbia. There, he became an American liaison to General Mihailovich and his chetnik forces. He spent several months at General Mihailovich's headquarters before returning to the Allied base in Bari, Italy on May 29, 1944. Musulin immediately began putting pressure on his commanding officers to allow him to return to Mihailovich and organize the evacuation of the downed airmen. It was not easy for Musulin to convince his commanding officers that this evacuation was feasible. He did so by stressing that General Mihailovich was not only a hero to his own people, but many of the American military command. 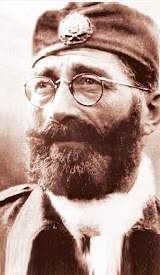 They knew well that when Yugoslavia fell to the Nazis in April of 1941, Mihailovich refused to surrender to them, leading a small band of men into the Serbian hills of Ravna Gora to initiate the first true guerrilla resistance movement in all of occupied Europe. It would also become one of the most effective despite the terrible obstacles it was burdened with, and would cause Adolf Hitler to postpone his planned attack on Moscow by several weeks, a postponement that would end up crippling the Nazi Army. 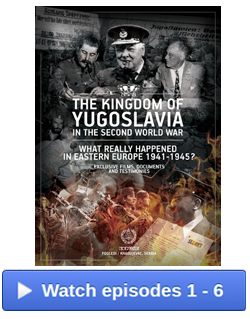 One of the difficulties of initiating the evacuations of the airmen in 1944 was that by this time, the British and the Americans, at the behest of the British, had officially withdrawn their support of Mihailovich and were now backing the Yugoslav communists, the Partisans, who were under the command of Marshal Josip Broz Tito -- an act of betrayal that stands today as one of the most destructive and treacherous of the entire war. However, when William "Wild Bill" Donovan, director of the O.S.S., got hold of Musulin's plans, he approved them immediately. That Summer of 1944, Lt. George Musulin, Sergeant Michael Rajachich, and radioman Arthur "Jibby" Jibilian parachuted into the hills of Serbia, not knowing if they would be captured and executed by the Nazis or fall into friendly hands. They were very lucky. The territory they landed in was controlled by Mihailovich's chetniks. Those Serbs who recognized 'Guv' Musulin from his previous stay in Serbia were overcome with happiness, as were the airmen, who now knew they had not been abandoned and left to their fate. So began the Halyard Rescue Operation. 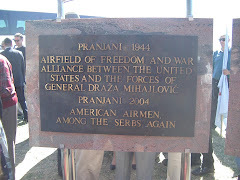 On the southern slop of the Maljen mountain in Serbia, not too far from the small village of Pranjani (Prah-nya-knee), there was a clearing that Musulin felt was large enough to be used as an airstrip for C-47 cargo planes. It needed to be leveled off and extended by some fifty feet. 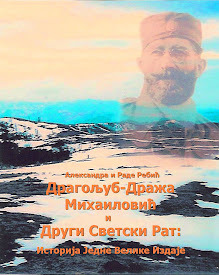 General Mihailovich mobilized hundreds of peasants in Serbia to do the job and make the airstrip happen. They came with carts, oxen, shovels, and tools and used whatever natural resources they could, such as dirt, to create that airstrip. One of the men overseeing the operation was Mr. Zvonko Vuckovich. Everything was finished and ready to go on the night of August 9th, 1944. The first C-47 plane was to land at 10:00 p.m. under the protective cover of night. There was, however, one very big catch. Only four miles away was a strong German garrison of 4,000 Nazi forces that had tanks, planes, and deadly ammunition at their disposal. That night, the first plane was to pick up 14 airmen and take off. Other C-47s were to follow. However, due to the abnormal amount of radio signals eminating from the area of Pranjani, the evacuation was not to remain the intended covert action that had been so carefully planned. The Germans picked up the radio activity, and it didn't take them long to figure out that something was happening. Musulin's radio communiques to the Allied base in Bari, Italy had been discovered by the wrong people. As he saw the German fighter planes begin circling overhead, the first thought that came to Musulin's mind was to stop the operation right away. But the first c-47 had already left Bari, Italy and was on its way to Pranjani, Serbia. Suddenly, somehow something apparently intimidated the Nazis and their planes disappeared after circling. There was no attack. That night of August 9, 1944 the first C-47 landed, picked up it's human cargo, and left without incident, completing the very first of the historic evacuations under the 'Halyard Mission'. In that first group was American Lieutenant Richard L. Felman of the United States Air Force, who would spend the next fifty four years of his life extending his gratitude and defending the honor and valor of General Mihailovich and the Serbian people against the brutal propaganda attacks waged against them by the communists and the ignorance of the Western Allies that allowed these attacks to be institutionalized and propagated throughout the world. Still, Musulin did not want to risk any lives unless he absolutely had to. Before any more planes could land, Musulin made the decision to abort the evacuation for that night. He decided to continue first thing in the morning, during daylight. There 250 fallen airmen left to be evacuated. All those around hin thought that he had gone mad, but they went along with the plan. It turned out to be a brilliant plan. The darkness of night did not allow for the protection that P-51 planes could provide as air cover over the C-47 cargo planes, but daylight did. The following morning, August 10, 1944, at exactly 8:00 a.m., the first American cargo plane landed on the Pranjani airstrip in Serbia while P-51s circled relentlessly as cover. They fired at known German bases, while on the ground, some 8,000 of General Mihailovich's Chetniks, the best men he had, ringed the area of Pranjani like a fortress. The Nazis didn't have a chance to interfere without bringing in massive additional forces. The evacuation went like clockwork. The C-47s landed, loaded, and took off. That big daylight operation, following the very first one of the previous night, took 240 Allied airmen to freedom. 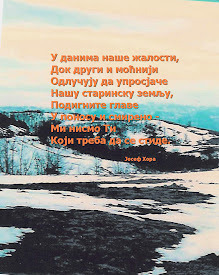 When the good-byes were said between and the Serbs that had so vigilantly watched over them, they were not said easily. There were many tears. Many of the airmen, as a parting gift, threw their shoes to the Serbs. Many of these rescued airmen would end up devoting much of their time and effort after the war ended to do justice to these people that had saved their lives and to the leader who had led them. These evacuations would be repeated several times over the next few months, As Allied airmen continued to be shot down, making their way to Serbia and to other Serbian lands in Yugoslavia, where they knew that the safest place for them was among the Serbian people loyal to General Mihailovich. Captain Nick Lalich would replace Musulin, who was reassigned to Nationalist China at the headquarters of Generalissimo Chiang Kai-Chek as the American liaison officer. 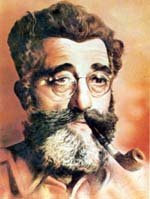 Lalich, another American of Serbian descent, became the O.S.S. contact for the Halyard Operation and would supervise the last of the evacuations in December of 1944. He would be the last American officer to have contact with General Mihailovich and see him alive. In the annals of history, the Halyard Mission stands out as one of the great shining moments when human heroism and honor prevailed over all obstacles. The courage and integrity exemplified by those who carried out those evacuation operations in 1944 is unprecedented. 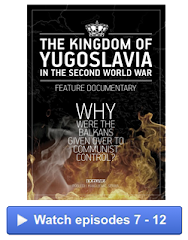 By that time, General Draza Mihailovich and his forces had been abandoned by the Allies and left to the Nazi and communist wolves in Yugoslavia. Despite this betrayal, the General would save hundreds of Allied lives that had fallen into the hands of his people. Not one fallen Allied airman fell into enemy hands. Not one was sacrificed. The Halyard Mission Rescue Operation was the product of the perseverance of American Serbs such as Captain "Guv" Musulin, Captain Nick Lalich, Master Sergeant Michael Rajacich, George Vuynovich of the O.S.S. in Bari, Italy; a Serbian General leading the resistance in Serbia, Colonel M. McDowell, Chief of the Intelligence Mission to Mihailovich, American radioman Arthur "Jibby" Jibilian, and others who ran the operation and got it done. It was also the product of so many native Serbs, both armed guerrilla forces and the civilians who protected the airmen under the worst of circumstances, even at great risk to their own lives. 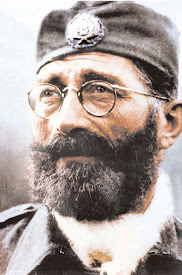 On May 31, 1994 in Chicago, Illinois, as the world began it's commemoration of the 50th anniversary of D-Day, a fifty year debt of gratitude was repayed to the Serbian general, Dragoljub-Draza Mihailovich, who was, and remained, the greatest hero of all to those who knew the measure of the man.